(By Shahid Qureshi – London Post) UK service personnel are poised to take part in the biggest NATO exercise in more than a decade. Exercise Trident Juncture will bring together armed forces from across the world to test the NATO Response Force (NRF) and other allied forces, and will involve all three of our services – the Royal Navy, Army and Royal Air Force. More than 30 nations will take part in the five-week exercise, which begins on 4 October and takes place in Italy, Portugal and Spain. The UK and other participating NATO allies will commit 230 military units, 140 aircraft and more than 60 ships to the exercise, drawing in a total of around 36,000 international troops. Trident Juncture will put the NRF through its paces – with specific focus on how it responds to a crisis situation – demonstrating NATO’s readiness, flexibility and capability of responding to threats from any direction. The two-part exercise, NATO’s biggest since 2002, will also ensure that NATO allies and partners can work together effectively. Another important facet of Trident Juncture is to test the functions of the Very High Readiness Joint Task Force – or Spearhead Force – ahead of it becoming fully operational next year. The UK will commit around 2,800 personnel to Trident Juncture, including an Army Brigade Headquarters and Battlegroup, three Royal Navy warships and aircraft, including Typhoon fighter jets and helicopters. 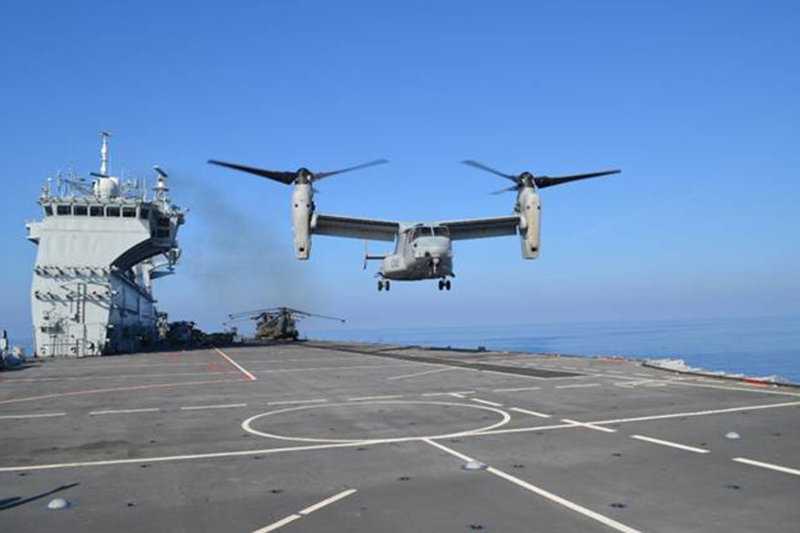 Amphibious ship HMS Bulwark, currently alongside in Gibraltar, is en route to take part in the exercise together with helicopter carrier HMS Ocean, which is the UK’s largest warship and the flagship for Trident Juncture. In a darker and more dangerous world, it is vital that we work with our NATO partners so we can respond to any threat. That’s why the UK will be right there at the heart of Exercise Trident Juncture – contributing nearly 3,000 troops, our two largest warships and our Typhoon fighter jets. The exercise will help preparations for NATO’s new rapid reaction taskforce, which the UK will provide troops for every year into the next decade and which we will lead in 2017. Trident Juncture is the biggest and most ambitious NATO exercise in more than a decade, focussed on exercising crisis response, collective defence, and helping to shape the future adaptation and posture of the Alliance. It will demonstrate the Alliance’s capability, readiness, and ability to address whatever threats it may face, now and in the future. I am delighted the UK personnel will be playing such a major part in this key undertaking alongside our allies and partners. It will be a clear demonstration of the UK’s unwavering commitment to NATO solidarity and security.